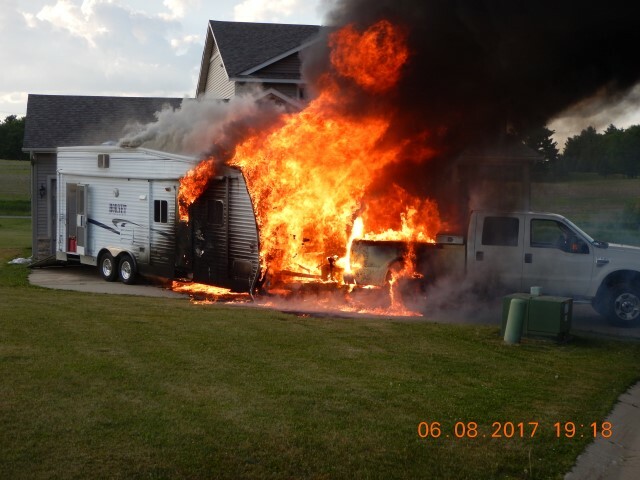 On June 8, 2017 at 19:08 the Black River Falls Fire Department was dispatched by the Jackson County Emergency Dispatch Center (EDC) to 1038 Laura Lane in the City of Black River Falls for a camper on fire. 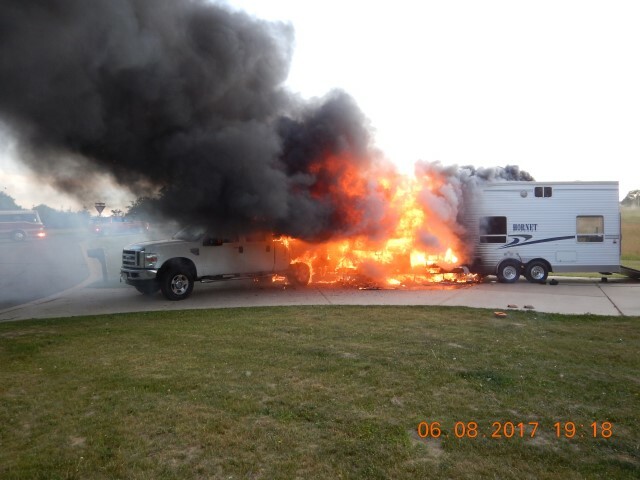 Upon arrival the department had a 2002 camper – toy hauler with heavy fire involvement that was extending into a 2009 pickup truck that the camper was hooked to. 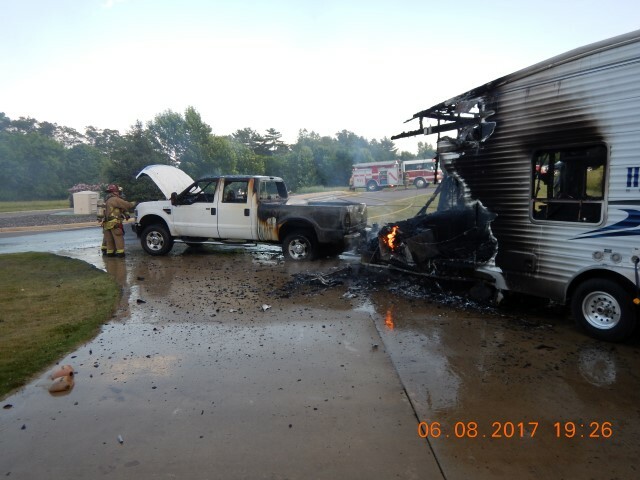 The two units were parked in the driveway of the owner and next to the owner’s home at the time of the fire. The owners were not home at the time and the fire was reported by a next neighbor. 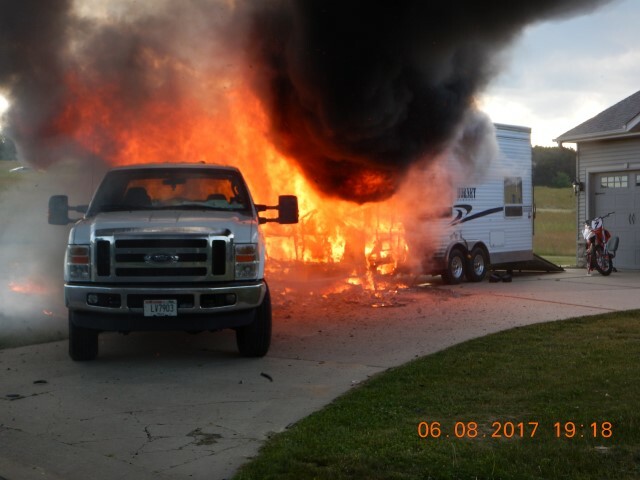 Both the camper – toy hauler and the truck are a total loss. The vinyl siding on the home and the garage door also have heat damage. A damage estimate is not known at this time. The fire cause is undetermined at this time. The department was assisted by the Black River Falls Police Department who conducted traffic control. Eight (8) firefighters were on scene for just under one hour. No injuries to any civilians or firefighters were reported. 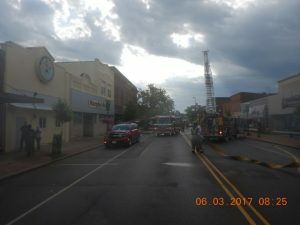 The Jackson County Emergency Dispatch Center (EDC) paged the Black River Falls Fire Department on June 3, 2017 at 07:35AM for a report of an apartment fire above Murphy’s Pub on Main Street in the City of Black River Falls. The EDC was also reporting occupants were evacuating the building. The first department unit arrived on the scene at 07:37 and observed several people on the sidewalk in front of the building at 119 Main Street. These parties were reporting a fire in apartment six on the second floor above the Pub. The second floor area of the building has a total of nine single room apartments. Upon entering the building and going to the second floor area a number of parties were noted to still be in the building. These parties were evacuated out of the building by the department. Smoke alarms were sounding in the building and there was smoke in the common hallway area on the second floor. It was reported to the department that the occupant of the apartment that appeared to have a fire within it may still be in the apartment. Smoke was observed coming from around the door jam area of the fire apartment and then fire could be seen under the door way of the same apartment. The department made an interior attack with a 1.75” line and had a quick knock down of the fire. The occupant of the apartment was found to be on the roof area over the pub. This party did have an injury to his arm and was treated on scene by members of Black River Emergency Medical Service. The party was then transported to Black River Memorial Hospital for further treatment of the injury. The fire was contained to the one 17’ x 11’ apartment. There is water, heat and smoke damage with in the apartment. The rest of the second floor area has smoke damage and there is also some water damage in the ground level pub area. 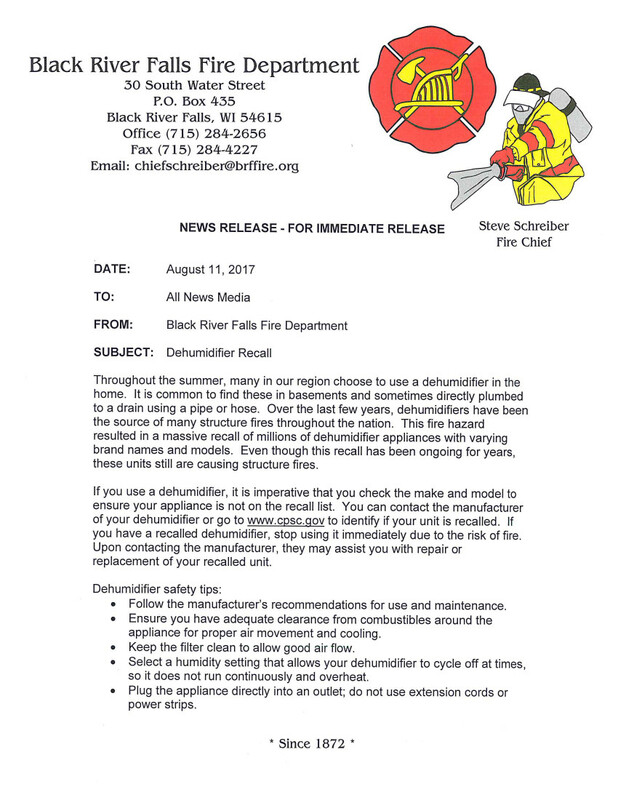 The fire investigation is being conducted by the Black River Falls Fire Department, State of Wisconsin Fire Marshalls Office, Jackson County Sheriff’s Department and Black River Falls Police Department. The Jackson County Sheriff’s Department provided traffic control – direction during the incident as Main Street in downtown Black River Falls was closed for about one hour. Also assisting at the scene was the Black River Falls City Utilities. The building is owned by Pat Murphy and is insured. 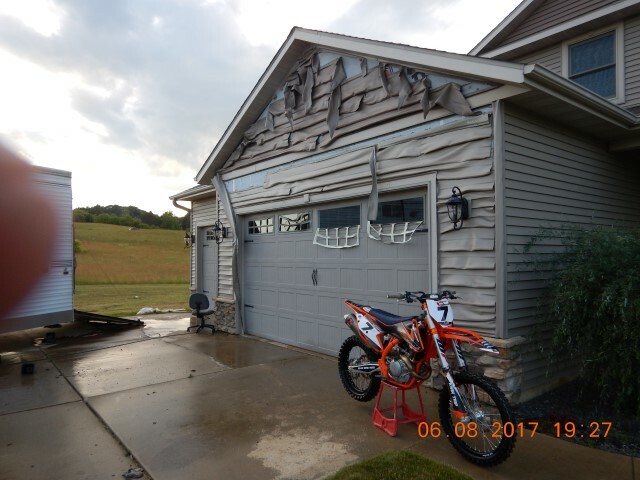 A damage estimate is not known at this time. It is not known if any of the second floor apartment occupants had insurance at this time. Nine occupants from the second story apartments have been displaced and are being assisted by the American Red Cross. The department was on the scene for just over one hour with 12 firefighters and used an estimated 150 gallons of water to extinguish the fire.